This course was published in the September 2018 issue and expires September 2021. The authors have no commercial conflicts of interest to disclose. This 2 credit hour self-study activity is electronically mediated. Discuss key biological considerations and the role of multi-disciplinary care in implant treatment planning and therapy. Explain implant protocols, and how the particulars of the case presented here illustrate the various factors involved in treatment decision-making and timing. Describe clinical considerations that influence the choice of whether to use a screw- or cement-retained implant restoration. FIGURE 1. Initial periapical radiograph of teeth #8 and #9. An open distal crown margin is seen in #8, while root fracture, periapical radiolucency, and bone loss are evident on #9. The utilization of a multidisciplinary approach is of utmost importance in dental implant treatment. In order to successfully plan and execute cases, the general dentist must be ready to work with specialists to generate complex treatment plans that may include surgeries, soft/hard tissue regeneration, orthodontics and implants. In addition, the patient must undergo diagnostics with a multitude of specialists. Periodontists, oral surgeons and even orthodontists are usually called upon to help in developing implant treatment plans. The general dentist may be able to plan the treatment; however, to guarantee predictable results, it is crucial to summon specialists’ opinions. At the University of Connecticut School of Dental Medicine in Farmington, the patient in this case first presented to the Advanced Education in General Dentistry (AEGD) residency program in July 2014. His treatment was planned and completed by both the AEGD and periodontology residency faculty, and involved work from a number of residents in AEGD and periodontics. It was essential for the key pro­viders to communicate on a regular basis to ensure continuity of patient care. 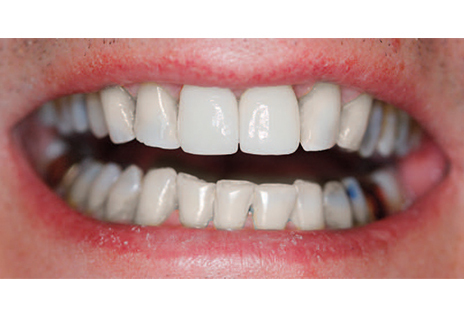 The Patient: A 50-year-old male’s chief complaint was the esthetics of his anterior teeth: the patient in this case report indicated that he was unhappy with the “recession” of his anterior gingiva, and spoke of a bad taste in his mouth. He reported no pain, swelling or bleeding. The patient was interested in fixed options and wanted to explore the possibilities of implants (Figure 1 and Figure 2). FIGURE 2. 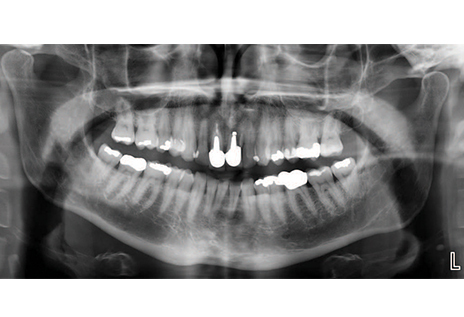 Initial panoramic radiograph shows no evidence of additional pathologies. His medical history revealed no known drug allergies and his medications included rosuvastatin calcium for hypercholesterolemia and divalproex sodium for anxiety. There were no contraindications to his receiving dental care based on his medical history. Exam and Relevant Findings: Upon examining the patient clinically and radiographically, it was found that tooth #8 had an old porcelain-fused-to-metal crown that was unesthetic in both contour and color. The grey margins were showing and it had been repaired with composite on the facial-gingival aspect. Tooth #8 had a crown-to-root ratio of 1:1 and thus could sufficiently be restored with a new crown. Tooth #9 had been endodontically treated and had a vertical root fracture, caries, and apical scarring due to a previous apicoectomy. An amalgam tattoo was present as a result of the amalgam plug placed at the apex. The treatment options were discussed with the patient, and it was decided that tooth #8 would need a new crown and #9 had a hopeless prognosis and required extraction. The patient was given fixed and removable options, and decided on a fixed option, which was to extract #9 and replace it with an implant. FIGURE 3. Postoperative bone level radiograph of implant #9 on day of surgery. The patient was referred to the periodontology residency program for a consultation and discussion of the treatment plan. It was decided the AEGD resident would work with the periodontal resident to execute the plan. The first step was extraction of #9 by the periodontal resident. Due to scarred apical tissue, it was decided the extraction socket would be allowed to heal for a few weeks prior to placement of the implant. According to Ochoa and Suzuki,2 four implant protocols exist, based on the bone remodeling process that occurs after tooth extractions. Immediate (Type 1) is when an implant is placed in a fresh alveolus at the time of extraction. Type 2 and Type 3 are when implant placement occurs at four to eight weeks or 12 to 16 weeks, respectively, after extraction. Although Type 2 implant placement allows for some soft tissue healing to occur, Type 3 implant placement awaits bone healing. Type 4 is late (i.e., traditional) implant placement, which occurs 16 weeks after extraction. The decision to do Type 2 implant placement in this case was based on the apical scarring of the alveolar socket of #9, which potentially could have healing problems. Ochoa and Suzuki2 explain the two-part objectives of this protocol. Initially, extra healing time for the socket minimizes the risk of pathology with implant placement. Second, it enhances the soft tissue available for primary healing and attaining a successful buccal contour around the implant. In summary, the protocol involved extraction without the use of a flap, debridement of the socket, four to eight weeks of soft tissue development, and subsequent implant placement with guided bone regeneration. FIGURE 4. Provisionalized crown on #8 and provisionalized implant crown on #9. After tooth #9 was extracted, the AEGD resident planned the implant placement based on the patient’s restorative needs. A CBCT scan was utilized to determine the quality of the bone in the desired implant position. The AEGD resident used the CBCT and implant planning software to digitally design and utilize additive manufacturing (i.e., 3D printing) to fabricate a surgical guide for placement of the implant. The Type 2 implant placement protocol and guided bone regeneration took place six weeks after initial extraction of tooth #9 by the periodontal resident. Upon uncovering the implant, it was also decided that a soft tissue graft was essential on the facial in order to maximize esthetics. The AEGD resident prepared tooth #8 for a new crown, and placed the provisional restorations for both #8 and #9. It was determined by the AEGD resident and patient that the provisional restorations were not properly aligned along the gingival zenith. 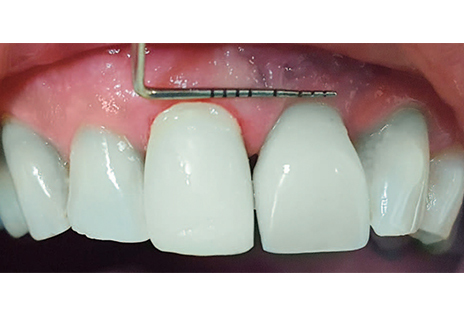 Modifications to the preparation on tooth #8 were done by lowering the facial margin of the crown to match #9. Final impressions for both crowns on #8 and #9 were done. 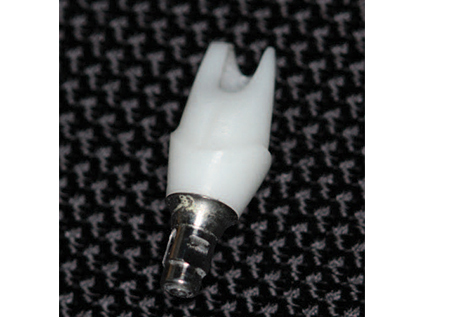 The AEGD resident and patient decided on a zirconia core crown with lithium disilicate pressed for maximum esthetics. 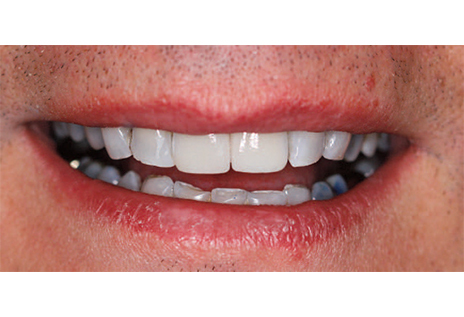 The proper selection of re­storative materials was es­sen­tial in this case for both the final crown and implant. Site #9 Implant: To achieve optimum esthetics, clinicians must carefully choose the ideal abutment and crown for the particular case, always keeping the soft tissue in mind. When deciding on whether to use screw- or cement-retained crowns, the clinician must consider multiple factors. Shadid and Sadaqa9 describe a number of key differences between the two, including esthetics, retrievability, implant position and peri-implant health. Wittneben et al10 offers a simplified decision-making tree with respect to the indication of screw- versus cement-retained implant crowns. 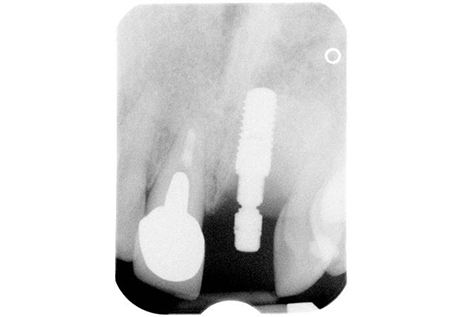 When following the Wittneben et al10 protocol for anterior bone-level implants in an ideal position, the best restoration should be screw-retained. When using a cement-retained implant restoration, there is a risk of cement being pushed subgingivally, which can potentially cause a soft tissue inflammatory reaction. Crown: In order to homogenize the restorations, a zirconia core with cutbacks and pressed lithium disilicate porcelain was selected. The shades chosen for both crowns were matched and photographs taken for the laboratory to design the crowns. Soft tissue: The desired emergence profile was communicated to the laboratory using custom impression posts. The final restorations were delivered. After some adjustments, the #9 zirconia crown was cemented to the abutment extraorally and the crown was torqued in. The #8 zirconia crown was cemented following the manufacturer’s directions. The patient reported being pleased with the final result (Figure 7 and Figure 8). FIGURE 6. Intraoral view of tooth #8 preparation and #9 hybrid abutment. FIGURE 7. Final restorations of tooth #8 zirconia crown with facial cutback, layered with lithium disilicate. Implant #9 restored with zirconia crown with facial cutback, layered with lithium disilicate cemented on a hybrid abutment. FIGURE 8. Smile line evaluation on day of delivery. Patient was satisfied with the esthetics. As shown in this maxillary anterior case, it is critical for the restorative dentist and surgeon to discuss the treatment plan. Communication between both providers involved continuous discussion as the case evolved, and the final restorative result would not have been possible without such collaboration. In addition to a multidisciplinary approach, evidence-based material selection is essential for the longevity of the restoration and to satisfy patient expectations regarding esthetics. April 2015: Extraction of tooth #9: no complications. No flap raised; buccal plate resorbed; scar tissue present. Essex retainer delivered. October 2015: Uncovered implant #9 with connective tissue graft to improve buccal tissue contour. February 2016: Implant #9 was provisionalized. March 2016 to July 2016: Site #8 was prepared and provisionalized. Implant #9 provisional was modified to bulk buccal tissue due to a lack of soft tissue volume. August 2016: The gingival zeniths of #8 and #9 were not aligned. #8 was reprepared to match zeniths. New provisional placed (Figure 4). Holst S, Blatz MB, Hegenbarth E, Wichmann M, Eitner S. Prosthodontic considerations for predictable single-implant esthetics in the anterior maxilla. J Oral Maxillofac Surg. 2005;63:89–96. Ochoa D, Suzuki T. Update on timing of implant placement after tooth extraction. Oral Health. 2005;58–60. Janyavula S, Lawson N, Cakir D, Beck P, Ramp LC, Burgess JO. The wear of polished and glazed zirconia against enamel. J Prosthet Dent. 2013;109:22–29. Jung YS, Lee JW, Choi YJ, Ahn JS, Shin SW, Huh JB. A study on the in-vitro wear of the natural tooth structure by opposing zirconia or dental porcelain. J Adv Prosthodont. 2010;2:111–115. Lawson NC, Janyavula S, Syklawer S, McLaren EA, Burgess JO. Wear of enamel opposing zirconia and lithium disilicate after adjustment, polishing and glazing. J Dent. 2014;42:1586–1591. Stimmelmayr M, Edelhoff D, Güth JF, Erdelt K, Happe A, Beuer F. Wear at the titanium–titanium and the titanium–zirconia implant–abutment interface: a comparative in vitro study. Dent Mater. 2012;28:1215–1220. Nakamura K, Kanno T, Milleding P, Ortengren U. Zirconia as a dental implant abutment material: a systematic review. Int J Prosthodont. 2010;234:299–309. 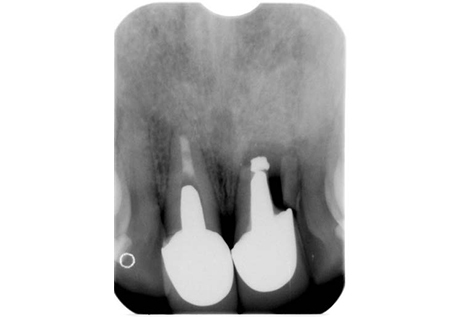 Shadid R, Sadaqa N. A comparison between screw- and cement-retained implant prostheses. A literature review. J Oral Implantol. 2012;38:298–307. Wittneben JG, Joda T, Weber HP, Brägger U. Screw retained vs. cement retained implant-supported fixed dental prosthesis. Periodontol 2000. 2016;73:141–151. From Decisions in Dentistry. September 2018;4(9):40–43. Sergio Sanchez, DDS, is director of the UConn School of Dental Medicine’s AEGD program. In addition to his teaching duties and administrative responsibilities, Sanchez provides care in the faculty practice at UConn. Geraldine Weinstein, DDS, is an associate professor at the UConn School of Dental Medicine, and is a recent recipient of the Kaiser Permanente Teaching Award. She can be reached at gweinstein@uchc.edu.